We’re running a bit low on interesting ingredients at the moment, and I keep diving into the back of the freezer and the bottom shelf of the pantry trying to find a little inspiration. 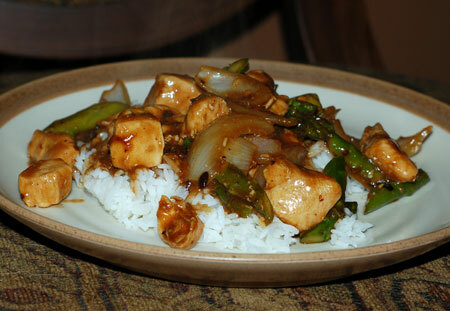 Last night turned up a little jar of black bean-garlic paste and some frozen chicken breasts, so I combined them with half a package of fresh asparagus in a quick stirfry that was really delicious. Since I now have an open jar of bean paste haunting the fridge, I expect to be making variations of this meal for some time to come. For marinade, combine 1 tablespoon each cornstarch, soy sauce, and sherry, with a pinch of sugar, in large bowl; mix well. Add chicken; stir to coat well. Let stand 30 minutes. Combine 1 T cornstarch, 1 T soy sauce, chicken broth, sesame oil, brown sugar, and oyster sauce in small bowl; mix well. Set aside. Heat 2 tablespoons vegetable oil in wok or large skillet over high heat. Add chicken; stir-fry until cooked through, about 3 minutes. Remove from wok; set aside. Heat remaining tablespoon of vegetable oil in wok. Add onion and asparagus; stir-fry 30 seconds. Add water and cover; cook, stirring occasionally, until asparagus is crisp-tender, about 2 minutes. Return chicken to wok. Add black bean-garlic paste and chicken broth mixture to the wok; cook until sauce boils and thickens, stirring constantly. Serve over rice.